Made especially for small dogs with food allergies and urinary diseases, Royal Canin Canine Hypoallergenic Small Dog HDS 24 is a nutritious food that helps to keep your small dog fit and healthy. Food intolerances and allergies affect a lot of small dogs. In some cases, they can make life very difficult for your dog, putting them off eating, or giving them an uncomfortable skin condition. Talk to your vet if you spot any weight loss, vomiting, diarrhoea, itchy skin, or nasty rashes as these can all be signs of an allergy. It’s a good idea to switch your dog’s food immediately. It could be the cause of the allergy and switching it will help to prevent the effects from worsening. Urinary conditions are also very tough on your dog. These are caused by struvite crystals forming in your dog’s bladder. If you see that your dog is having difficulty peeing, or seems reluctant to pee, make sure that you talk to your vet about possible treatments. Royal Canin Canine Hypoallergenic is designed to replace your dog’s regular food. It’s designed to be hypoallergenic, which means that it’s unlikely to trigger your dog’s allergies. Foods like Royal Canin Canine Hypoallergenic are made for pets with specific clinical conditions, so we recommend that you only use them after talking to a vet. 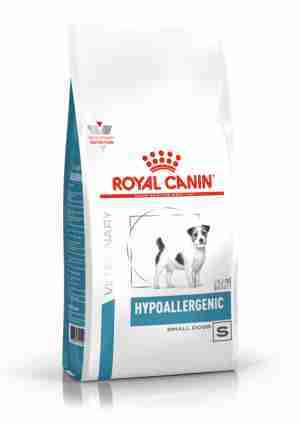 Royal Canin Canine Hypoallergenic is made with specially selected ingredients to be gentle on your dog’s allergies. This means that your dog can get back to their normal dietary routine as soon as possible. It’s made with easily digestible, yummy soy proteins, which is gentle on your dog’s stomach and helps to tackle your dog’s urinary condition by lowering the amount of struvite-causing ions in your dog’s pee. Veterinary diets like this one have been specially made to support pets with specific medical conditions. Because of this, they might not be suitable for all pets, so we'd recommend getting professional advice before feeding them to your pet. If you think your dog could benefit from eating Royal Canin Canine Hypoallergenic Small Dog HDS 24, why not have a chat with your vet? Rice, hydrolysed soya protein isolate, animal fats, minerals, hydrolysed poultry liver, soya oil, beet pulp, Fructo-Oligo-Saccharides (FOS), fish oil, sodium polyphosphate, taurine, borage oil, marigold extract (source of lutein). My Chihuahua has IBS and has 27 allergies. Since starting him on this food he has been fantastic and has only about 2 flare ups per year. He seems to love the food too. It has been like a miracle. My dog has had a lot of allergies, this food is hypoallergenic so easy to digest without causing upset. Its tasty and he always eats all of it, so it doesn't go to waste. I was recommended this food by our vet a few times and finally decided to give this a go after exhausting all options of expensive medication and other foods and I can say since using this food all my dogs allergies have disappeared. This is cheapest price for this food I can find and you can get it delivered to your door. I would highly recommend this food if your vet has suggested it as its worked wonders for my little pooch who's been on it for months now and he's been itch and rash free for months. The food is small little biscuits which is ideal for little dogs and the zip lock bag is great for keeping it sealed. My 4 year old Yorkshire terrier had a very sensative tummy, every now and then his tummy would pop and fizz although was on a sensative complete mix it clearly wasn't helping.Advised by my vet to try Royal Canin Hypoallergenic small breed complete I have found its been the best thing for my wee dog! He's so much happier now he has a settled tummy ! Recommended by my vets and it's great for the dog. Much cheaper here and delivered to the door.